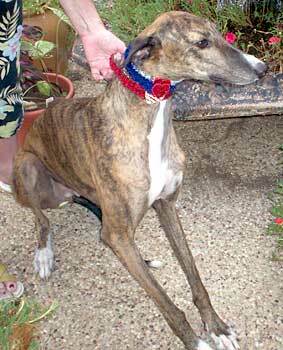 Born on October 26, 2003, Bub, aka Mr Bub, is a 2-year-old brindle male. 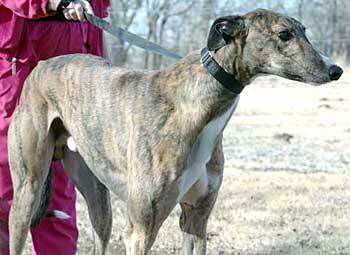 Bub's dam is J Johnson and his sire is the famous Molotov, making Bub a half brother to a host of GALT dogs, the most recently adopted being Impala. Bub started his career of 14 races in Florida, competing at the Flagler and Naples-Ft Myers tracks. 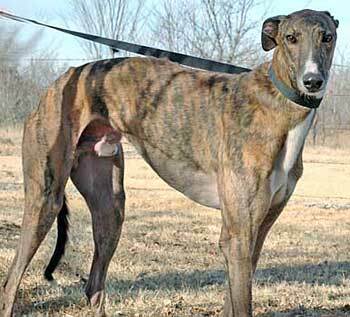 After moving to Texas to run his last two races at the Valley track, Bub retired and joined the GALT family. It is not known at this time if Bub is small animal or cat tolerant. Mr. Bub is doing great, having adapted easily to a household of five other dogs. He is house trained, crate trained and rarely barks. He walks nicely on a lead, loves playing with toys, plays ball and sits easily (look at his picture to the right). He is very gentle and easily trainable (and has already received quite a bit of obedience training). He is small-dog friendly and allows us to dremel his nails. This boy is a real companion, loves people and is a wonderful dog just like his dad, the great Molotov. If I could have a sixth dog, he would be the one. He is as nice as he is handsome. 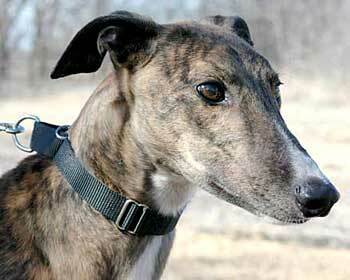 Someone will be lucky to have him as a "forever Greyhound."